Our showroom floor at 5438 West Sample Road in Margate, Florida. Browse watches, necklaces, rings, clocks, pendants, earrings and more. Precious Moments Jewelers, Inc. exists today as one of the most well-respected and prominent full-service jewelry stores in all of Broward county. Founded in 1988 by Emil and Liz Soussou, this family-owned company has enjoyed nearly three decades of uninterrupted service in the Peppertree Plaza in Margate, Florida. Our clientele consists of thousands of loyal customers developed over several generations of trust and experience, all of whom were retained through positive word of mouth and consistency of quality in all areas. From gold and diamonds to watches and repairs, the ownership and staff at Precious Moments Jewelers, Inc. will tirelessly strive to ensure the satisfaction of any consumer. The distinct advantage that Precious Moments maintains over competing jewelers is the ability to provide several unique, expert services to its valued customer base as well as a vast inventory of products. Patrons of PMJ are able to purchase not just jewelry, but also watches, clocks, parts, tools and accessories, as well as loose diamonds and other precious/semi-precious gemstones and metals. Expert services include, but are not limited to: Jewelry or timepiece repair, formal or informal product appraisal, luxury watch assessment and overhaul, replacement of watch batteries, bands and bracelets, product cleaning and polishing, market-price purchase of gold and diamonds, and much, much more. One of our jewelers polishes a custom-made gent's wedding band. Work with our staff to ensure that your jewelry is manufactured to your liking. 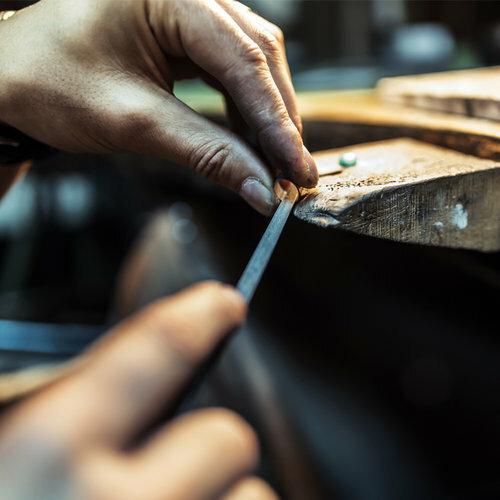 From the inception of an idea to the finished product, we specialize in every aspect of the jewelry-making process. Precious Moments Jewelers specializes in creating jewelry from scratch to suit your needs, often transforming an initial drawing or even a vague idea into a calculated and beautiful masterpiece. Our two main priorities in a custom creation are building the order as closely as possible to the client's original vision, and maintaining a cost efficiency that minimizes the overall budget. Call us to discuss your idea or visit our store to share your vision. We can often begin work the very same day! The distinct advantage that Precious Moments Jewelers maintains over its competition is the ability to provide any kind of jewelry repair. Our services include but are not limited to: soldering gold, platinum & silver, ring sizing, diamond setting, polishing, gold & rhodium plating, stone replacement, pearl restringing, and much more. The majority of repairs will never take longer to complete than 3-5 business days, while others can be completed during the same visit while you wait in our store. Along with repairs, we also provide appraisals on your most valuable pieces of jewelry, diamonds, and antiques. Our appraisals are crafted and signed by a certified jewelry appraiser and include an educational cover-sheet explaining our process. All of the pertinent information on your jewelry can be assessed while you wait in our store, and you can opt to have your appraisal picked up along with your order, mailed to your home address, or sent via email in no longer than one week. Every PMJ appraisal includes pictures of your jewelry, that day's value of each item at fair market price, and every relevant detail of your pieces all printed on our corporate letterhead for either insurance or private sales purposes. We have been servicing all major brands of watches for over 28 years. Our in-house watch repair facility gives us the ability to perform every type of repair on both watches and clocks, even antiques. From simple battery replacement to complete overhaul on high-end automatic watch movements, we have the tools and experience you are looking for when trusting someone with your valuable time-piece. Additionally, we are one of the few establishments offering custom-cut watch crystals. Through a highly-specialized process, we can create crystals of nearly any shape to smoothly fit any size watch case. Missing a different part for your watch or in need of a replacement band or accessory? We can often order links, bracelets, bezels, and entire movements for your watch straight from the manufacturer at a fraction of the price (especially from our partners Movado and Seiko).